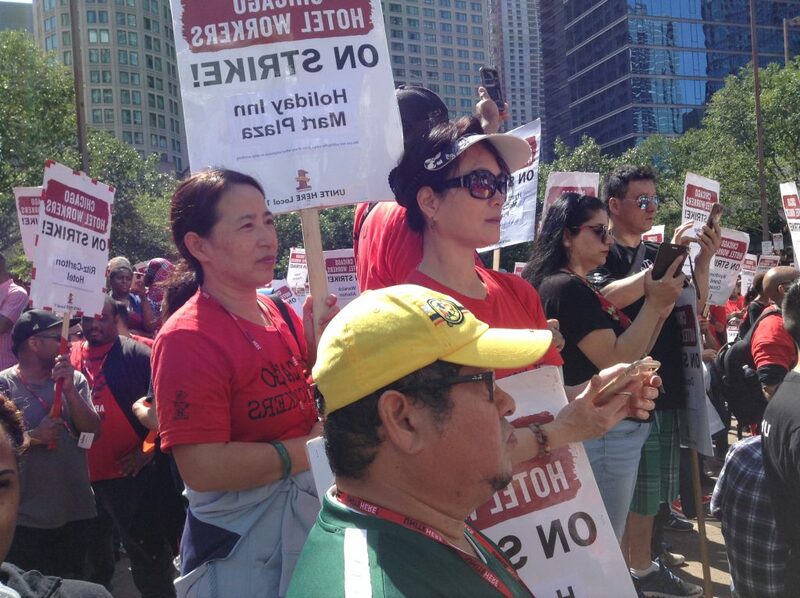 Chicago—Striking hotel workers by the thousands traded their picket line duties for a rally and march through downtown Chicago on Sept. 13. It looked like a bumper crop of picket signs that UNITE HERE Local 1 members held aloft across the street from the Sheraton, each declaring ON STRIKE and naming their employers, including Hilton, Marriott, Hyatt and other major chains. Photo: Bob McGuire for News & Letters. The strike began on Sept. 7. Along with pension and wage issues, the biggest problem for many hotel workers was the interruption of health insurance coverage if they were seasonally laid off during the winter. Strikers are demanding year-round health coverage. So far hotels are open for business (poorly and slowly) with managers in unaccustomed roles. Strikers cheered members of the building trades unions who joined the rally in solidarity, and whose fellow members had all honored their picket lines and refused to cross. Teachers there were honored for the inspiration that the Chicago Teachers Union victory in their 2012 nine-day “illegal” strike still provides workers. Hotel strikers and their supporters then marched a mile, to chants like “No Contract No Peace,” past the Drake Hotel to a park for a celebration. Some strikers symbolically used tools of the trade like buckets and dustpans to pound out beautiful music. This entry was posted in Articles and tagged Bob McGuire, Chicago, Chicago Teachers Union, health insurance, hotel workers, strike, workers, workers' struggle. Bookmark the permalink.